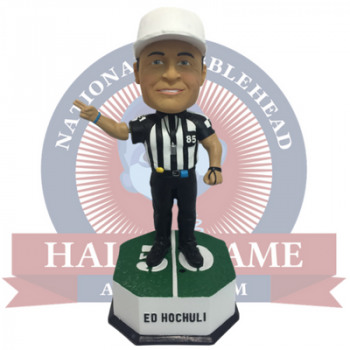 First bobblehead featuring legendary former NFL referee, Ed Hochuli, is now available exclusively in the National Bobblehead Hall of Fame and Museum's Online Store. Milwaukee, WI – December 5, 2018 – Today, the National Bobblehead Hall of Fame and Museum unveiled the first bobblehead featuring former legendary NFL referee, Ed Hochuli, who retired following the 2017 NFL season. Hochuli officiated for 28 seasons in the NFL from 1990 to 2017, spending 26 of those years as a referee. The limited edition bobbleheads, which are individually numbered to only 500, feature Hochuli in his referee uniform making a first down signal. In addition to the bobbling head, the arm also bobbles. The bobblehead also features sound clips that play several of Hochuli’s on-field calls. The bobbleheads just arrived and are now available for sale in the Hall of Fame and Museum’s Online Store for $25 each plus a flat rate shipping charge of $8 per order. Five dollars from every bobblehead sold is being split between two charities that Hochuli is passionate about—Autism Speaks and the TJR Foundation. Ed is not receiving any portion of the proceeds from the sale of the bobbleheads. Hochuli, who was born in Milwaukee, Wisconsin, on December 25, 1950, became the NFL’s longest-tenured NFL referee for a decade following the retirements of Gerald Austin and Larry Nemmers after the 2007 season. Hochuli has also served as an attorney at Jones, Skelton & Hochuli, P.L.C. since 1983. Prior to his officiating career, Hochuli played college football for four seasons at the University of Texas at El Paso (UTEP). During his NFL career, Hochuli, who wore number 85, worked numerous playoff games, including two Super Bowls. He is best known for his athletic and muscular physique and for explaining on-field rulings in a manner that is comprehensive, clear and concise. Hochuli tied NFL Mike Carey in a 2008 ESPN poll of NFL coaches to determine the best referee. Hochuli's long-time presence on the field and TV screens across the country led to a cult following. His rise in popularity is believed to have been started by former NFL quarterback and current color commentator for the NFL on CBS, Phil Simms, who pointed out the size of Hochuli's arms during a telecast. In homage to his large biceps, he is often affectionately referred to as "Hochules", a portmanteau of his last name and "Hercules”. Hochuli's career as an NFL official was chronicled on the NFL Network's Six Days to Sunday in 2005 and detailed Hochuli’s weekly preparation routine. Hochuli's off-field celebrity status includes appearing in the Madden NFL video game franchise and appearing on the cover of Sports Illustrated. The National Bobblehead Hall of Fame and Museum is finishing set-up of its permanent location, which is expected to open this winter. The HOF and Museum was announced in November 2014 and hosted a Preview Exhibit in 2016. The HOF and Museum also produces high quality, customized bobbleheads for organizations, individuals and teams across the country. Visit us at www.BobbleheadHall.com, www.facebook.com/BobbleheadHall or www.twitter.com/BobbleheadHall.